I don’t post my finished product much to this blog. I tend to focus on “the process” but here is an exception. Much gratitude to Linda Haddock at EchoInJohnsonCity for her generosity in creating a salute to Dementia Awareness Month. 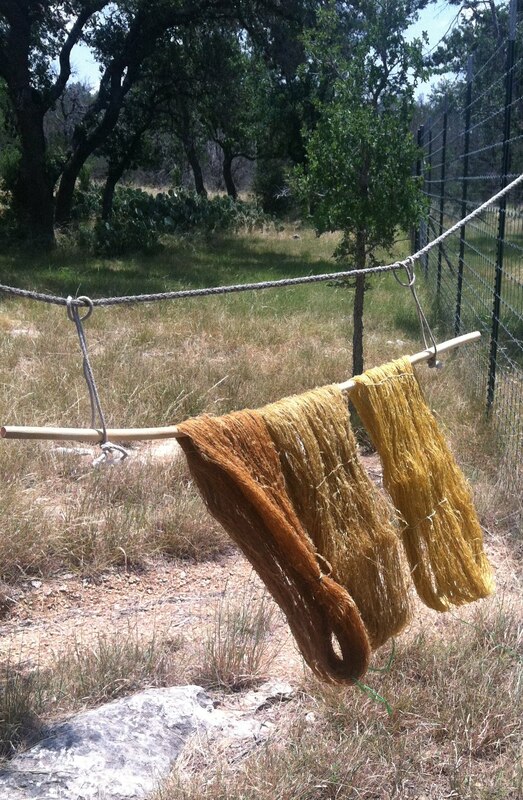 My natural dye block woven rug which she purchased via the Hill Country Science Mill Auction is featured in her store. 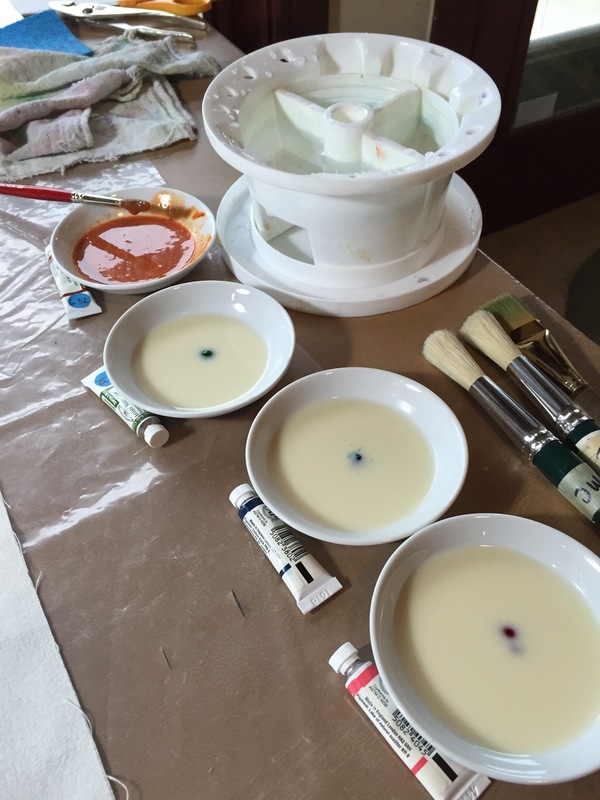 Today I finally got to play with my soy milk, watercolors & natural dye pigment. These ideas came from the Japanese Katazome tradition taught by John Marshall. John covers the basics here on his web page. My friend, Marge, helped me figure out my support frame. Once that puzzle was conquered we sized test scarves with soy milk. We let the scarves cure for a couple of days and after Marge left I got to do some color play. The watercolors mixed nicely with the soy milk. I do need to work on my brush work and stencil skills. My pigments that I precipitated with calcium hydroxide were definitely not as bright as the watercolors. The lichen oxidized from purple to brown during the precipitation. The weld exhaust was….well, exhausted. I got a nice yellow back wash but not weld yellow. 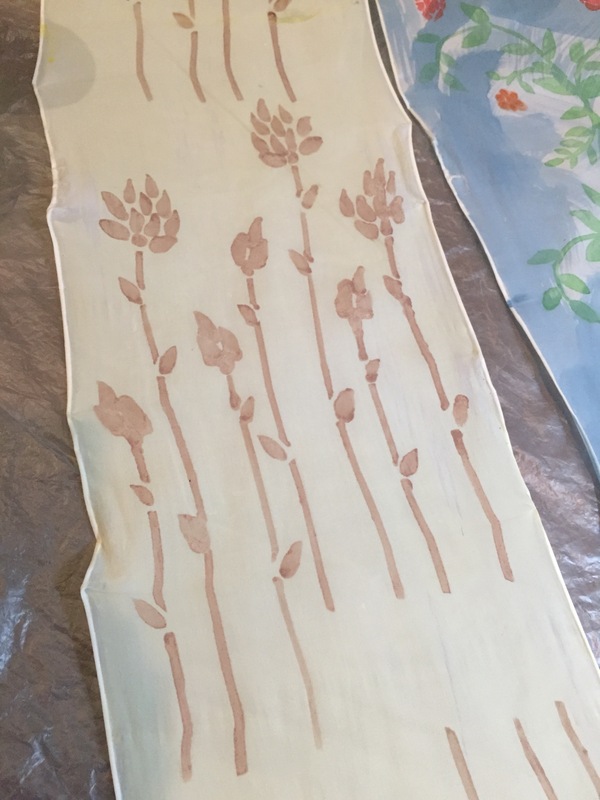 The pieces are drying and tomorrow I will mount them on their frame and give them their final coat of soy before I set them aside to cure. Once cured they will get a hand wash and steam pressing and I’ll see how each method, natural dye precipitation and watercolors work with soy. I am happy with the possibilities! After 20-30 mph winds one day, marble size hail another day and a driving rain on a different day it is a great morning to harvest the windfall lichens. Especially with the am humidity and mist the lichen easily peels of the branches instead of crumbling in the dry weather. 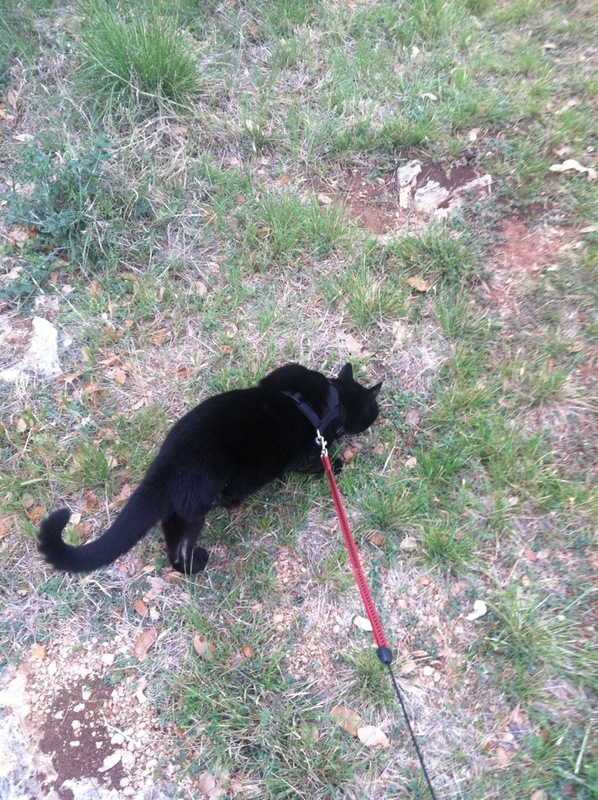 Now if I could only get Harley the tripod cat to go near the trees where the lichen windfall is located! 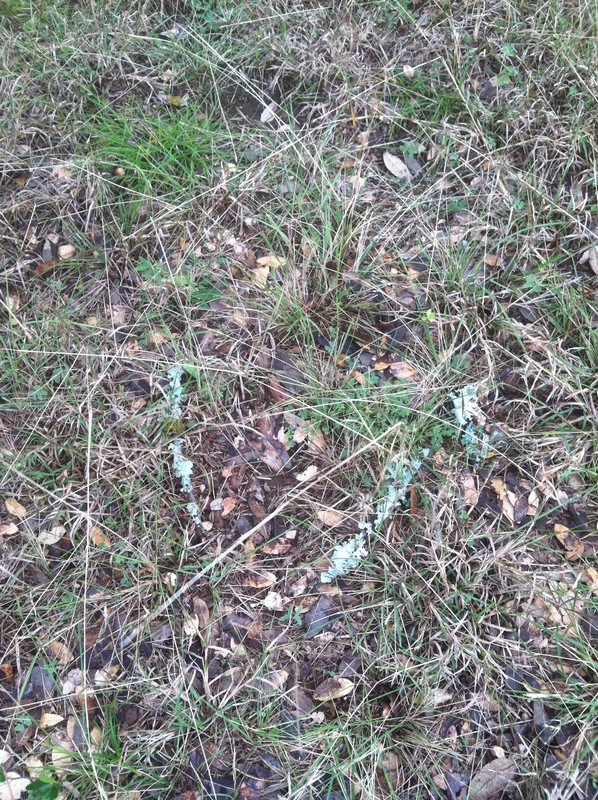 It’s a windy, cold & wet day here in the Hill Country, perfect for harvesting windfall lichen. I can finally bend over to pick up lichen without my shoulder feeling like it will fall off. Yahoo! My dye hoist has been installed on the dye patio. Once the sun comes out this week I’ll post some photos. Back to lichen gathering. See how the grey glows against the grasses? My shoulder surgery therapy has moved to strengthening (1-2# weights). Things are moving in the right direction. In the meantime I am trying to explore areas that I can maybe use on painted warps in the future. Hopefully giving my shoulder time to calm down from the weight exercises. 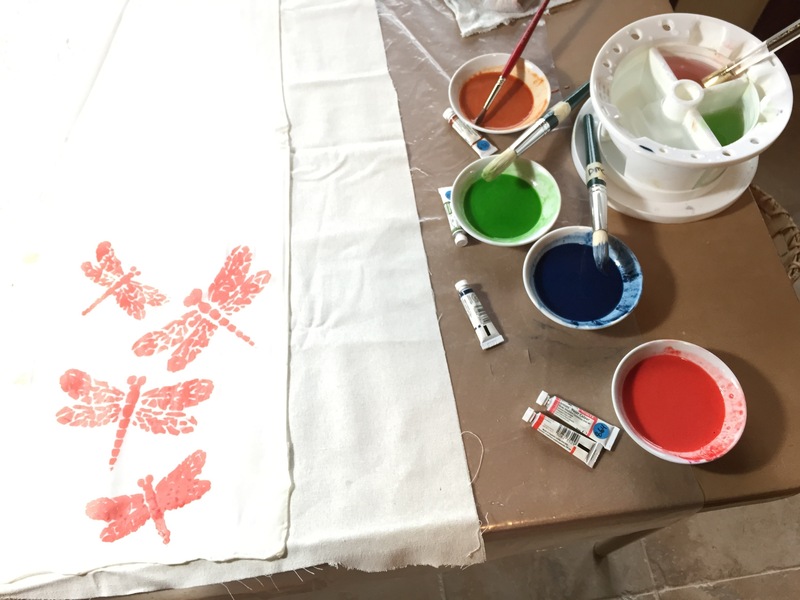 Today I am venturing into screen printing with natural dyes. 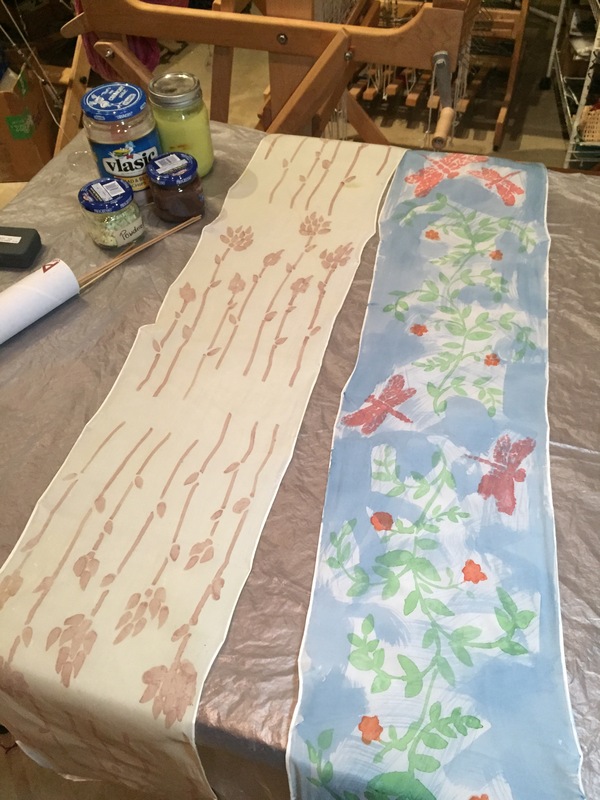 I’ve learned from Michel Garcia and Catherine Ellis about using the iron modifier in your thickener to screen print THEN run your natural dye bath. So, I mixed my guar gum and created ferrous acetate from my ferrous sulfate and let fly with the screens. The test silk is drying now. I am risking my test silk to see if it is damaged by the iron. Tomorrow I’ll dung it with calcium carbonate to fix the iron. Once it is dry the iron is bonded and won’t migrate from the print. Then some pieces will take a trip thru my persimmon dye and some thru the lichen. 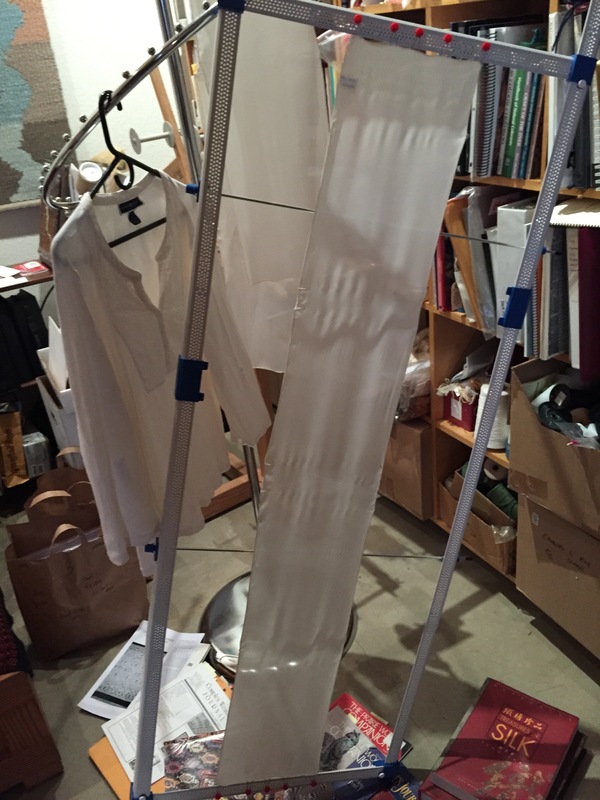 Once I am happy with my tests I’ll move on to some silk scarves and a silk shirt for a real skill test. 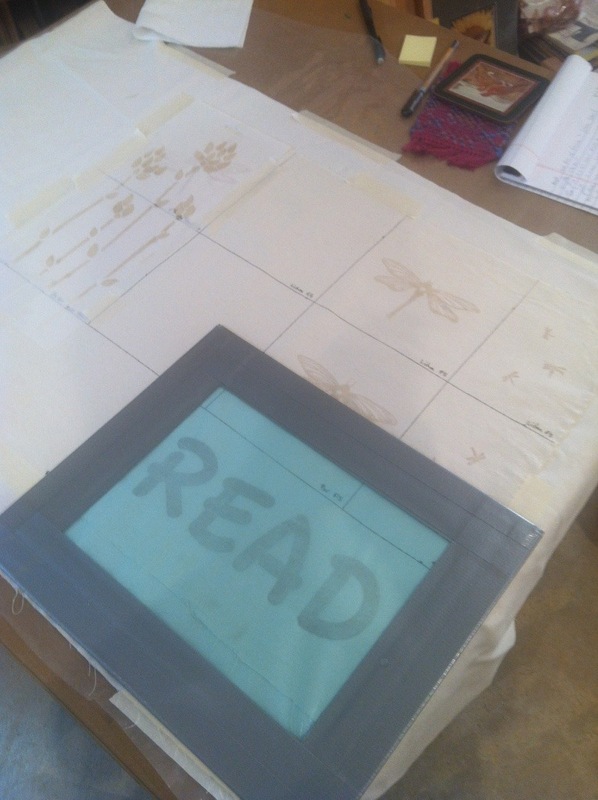 The blank squares on the piece were left for just printing with lichen and the guar gum, always room for one more test! I’ll be able to see if my lichen and persimmon dyes are strong enough to cold print and solar set. I’ve had many questions on my lichen processing. Most of my skeins are mordanted with 12% wof of alum sulfate. sometimes I add 6% Cot. Here is a recap from my old blog and some great reference links. Finally a group collaboration led by Glenna Dean in comparing our process notes and working thru Glenna’s process in Turkey Red Journal. 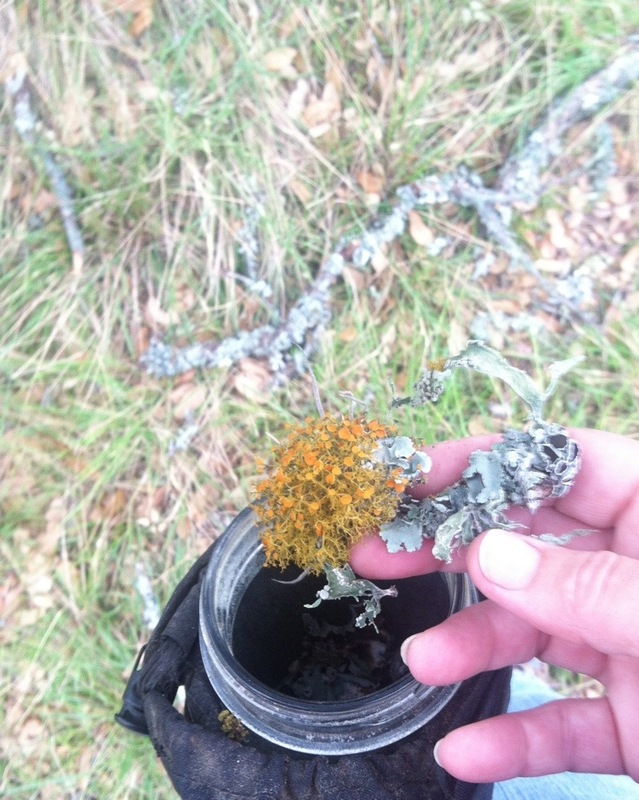 Most of us had worked with lichens before so there were some great conversations. I am a little late posting my results but better late than never! May I add that it was not the smartest practice for me to run lichen (purple) and yellow (persimmon and weld) baths at the same time. 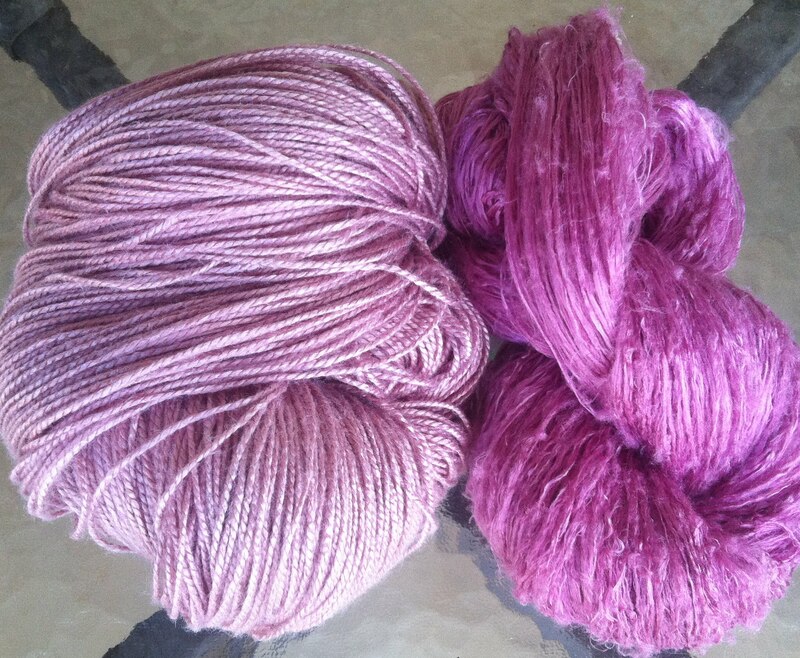 I had to be way more obsessive with my pot washing to ensure I did not mix the two colors on my skeins. I’ve also decide I like running one substrate at a time. 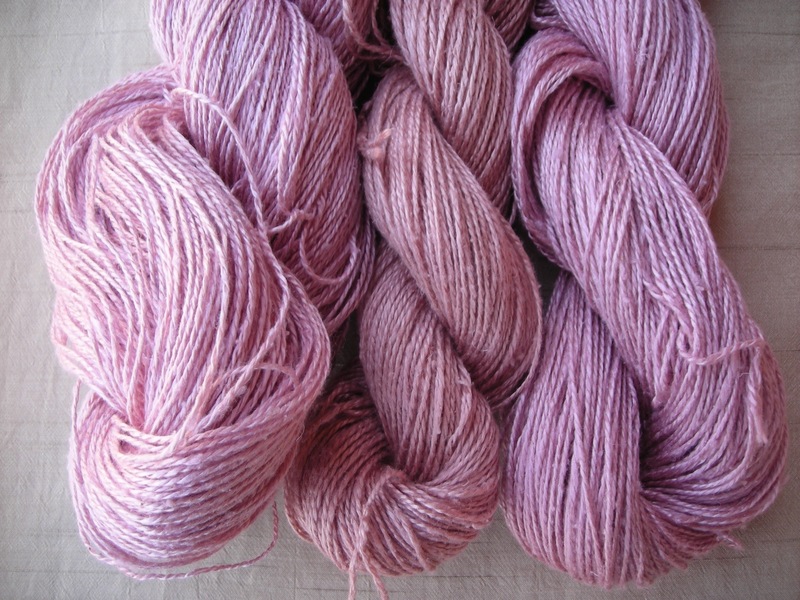 The two type silks and wools work easily in the dye bath but they required different lifting and processing. 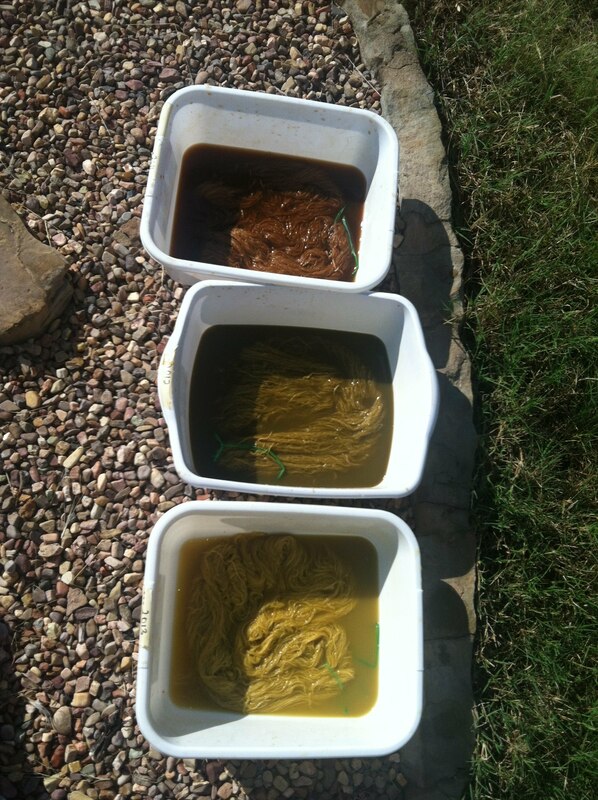 That is because I was doing some clean up overdyeing and dyeing some stash busters. I’ll be more orderly in the future! 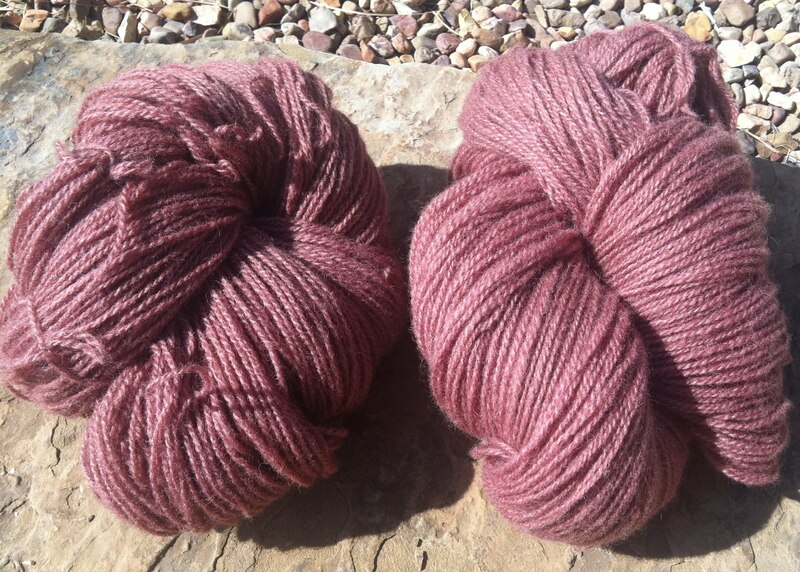 This wool was over dyed with my lichen (some leftover 2nd & 3rd exhausts). The first photo is some easter cedar which was a nice golden beige but I wanted to see what the lichen would do over the beige. 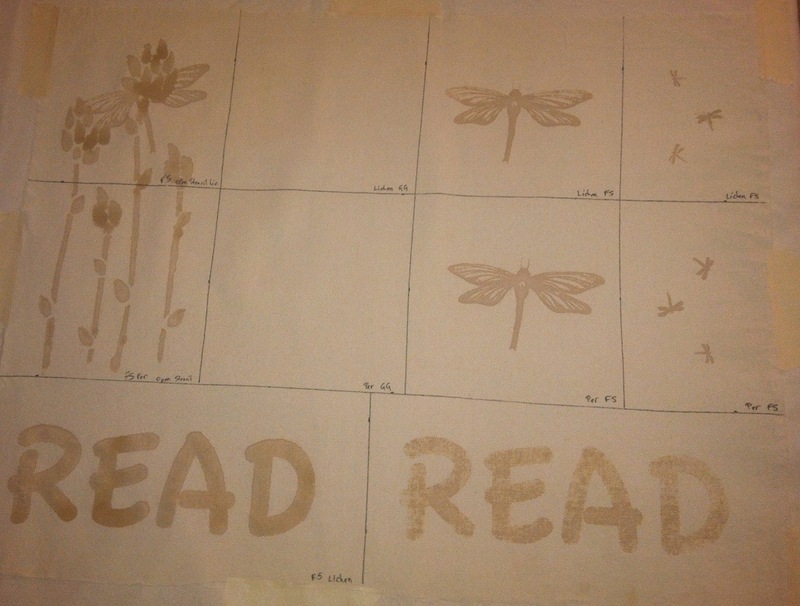 The lower photo is what I got with the lichen over dye. Nice,one really cannot see the yellow beige shining thru the purple lichen. This is going into my rug planning. In the meantime, I had some silk that I had degummed Rapenzul from Henry’s Attic and some Habu silk. They both took the 1st exhaust lichen in a very BRIGHT way! The raw silk really took on a bubble gum pink which is startling to me. I’m trying to get use to it but I’m thinking an iron overbath might make it more bearable for me. Or maybe indigo…..it is almost time to do the first indigo harvest….. 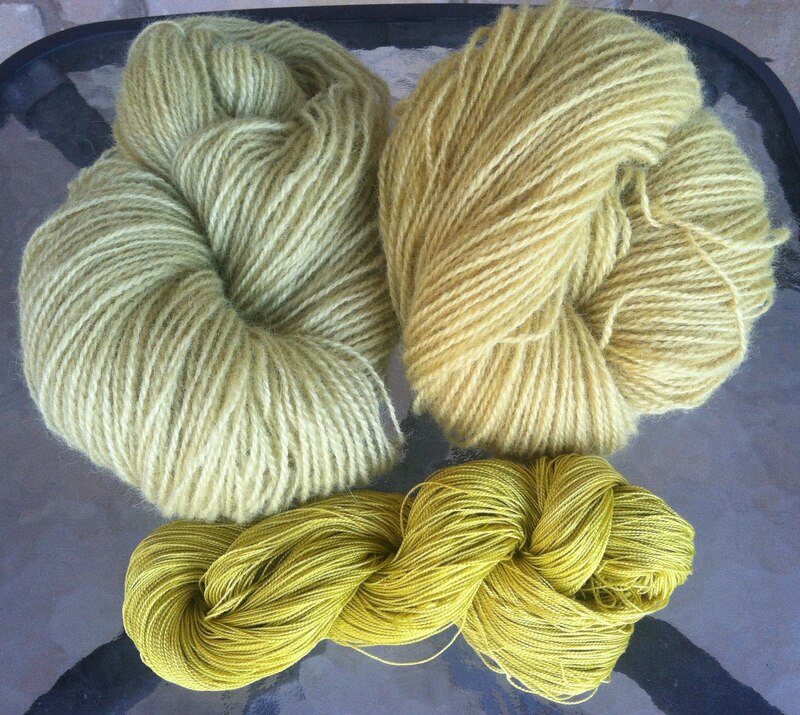 I tried my fresh weld and got a much fainter yellow on my wools than I got on my silk last year. 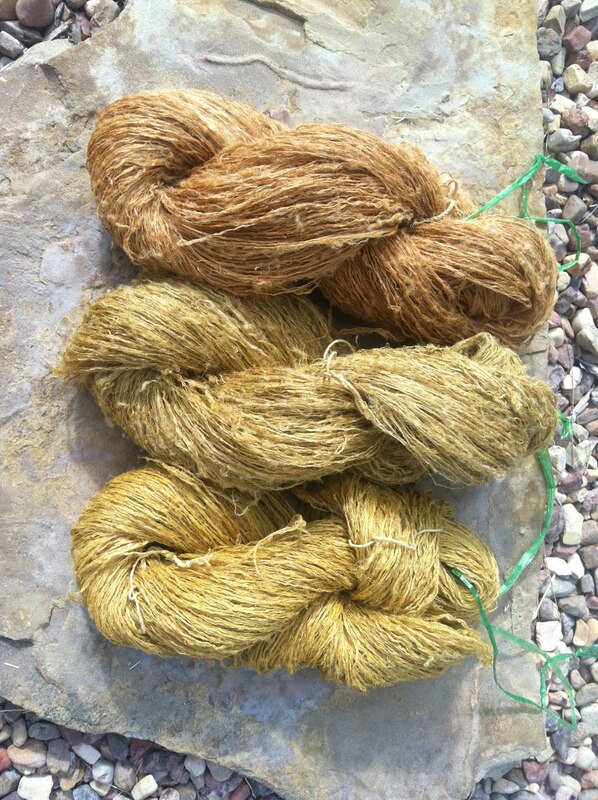 So I pulled my dried leaves from last year and cut much more fresh weld and redyed the wools. Can you see the difference? Both took on a much deeper yellow. Still not as bright in comparison to last year’s vibrant yellow on the silk! 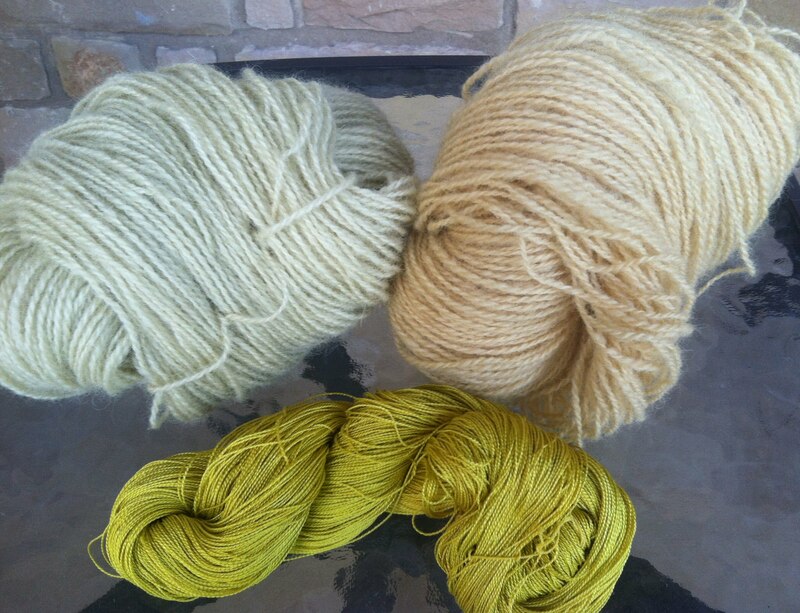 These large skeins will be broken down and dipped in indigo to create some greens. Cold Persimmon Dips with some Vintage varieties! Next I had my aged persimmon juice, 2011, 2012 and this year’s 2013. In my search for black I’ve been holding back some of the persimmon as I harvest it and set it aside to age and see if I can come up with a nice black. I am very happy with the 2011 color. There was not too much difference between 2012 and 2013 so I think a two year age is best. It has deepened considerably and I still have set aside to see what another year does to the color. 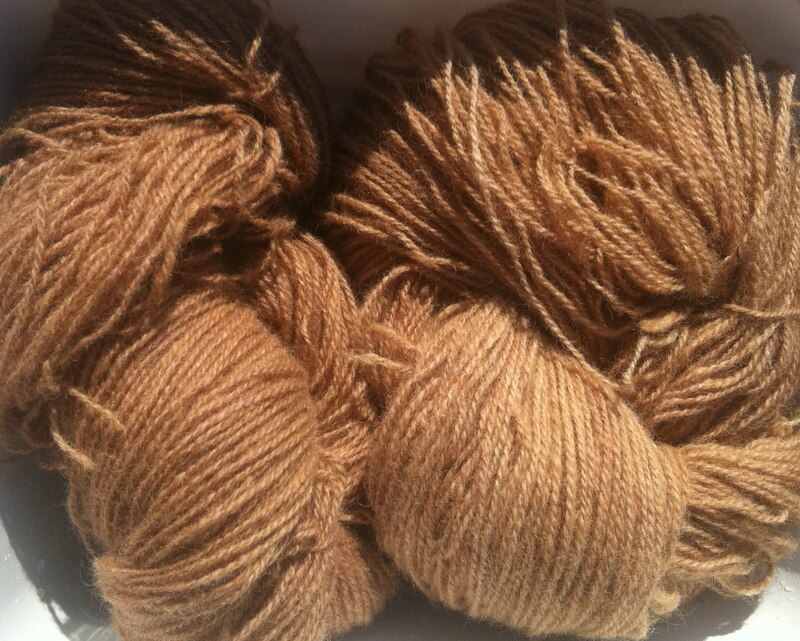 The other colors I’ll probably over dye with the upcoming indigo harvest!